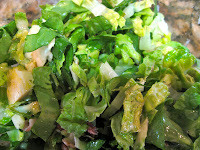 I got the inspiration for this salad from The Arrogant Butcher, a restaurant in downtown Phoenix. My friend ordered their brussels sprouts salad, and I helped myself to several forkfuls (yes, I'm rude like that). We both were surprised by how yummy it was, and I kept thinking about it for days afterward. I remembered the main flavors, and so I experimented with making one of my own. 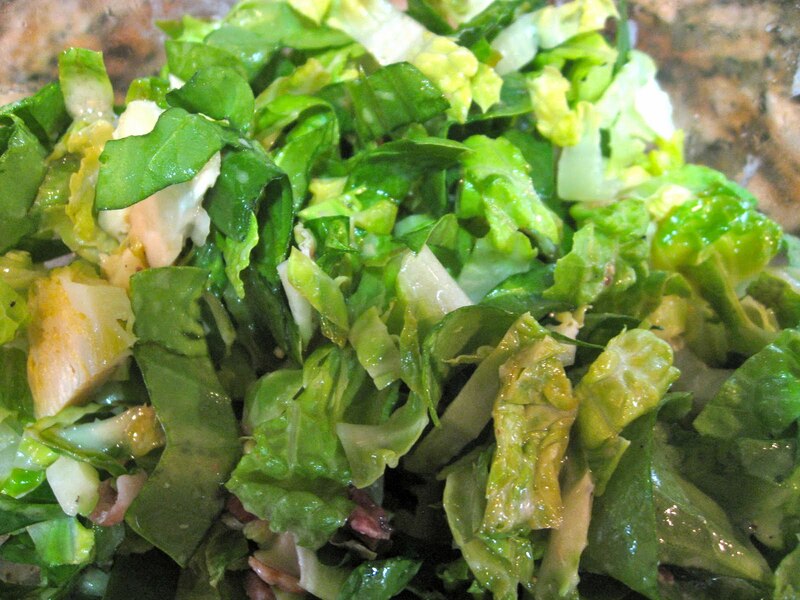 I have to admit that while my salad recipe is an original creation, the dressing is not. 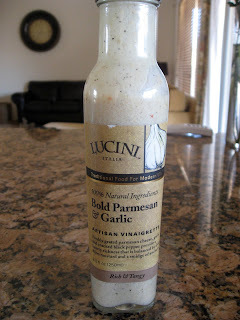 The one I repeatedly turn to is Lucini's "Bold Parmesan and Garlic," but I'm sure any slightly creamy, garlicky, parmesan cheesy dressing would do. Cook the bacon until crisp (I just use the microwave method). Let cool and crumble. Heat some olive oil in a pan and lightly saute the chopped brussels sprouts until they're slightly tender, but not super soft (you want them to still have some crunch). Squeeze in some fresh lemon juice, and add some salt and a few sprinkles of parmesan cheese. Take the brussels sprouts off the heat and let them cool. Then toss them together with the bacon, spinach and romaine. Add dressing and top off with some more parmesan if you wish.